5 Celebrity Weddings We Are Excited About - Wedding Affair var admin_url = "https://weddingaffair.co.in/wp-admin/"
Celebrity weddings are all about grandeur and glamour. Their weddings have a charm that is so pleasing that you just can’t have enough. Here are 5 celeb couples we can’t wait to see get hitched. The first on the list has to be Ranveer Kapoor and Deepika Padukone, the super adorable couple. The couple has been dating each other since a very long period now and Ranveer has never shied away from public display of affection towards his lady love Deepika Padukone. We can’t wait for the twosome to get hitched. The recently engaged Priyanka Chopra and Nick Jonas are the one power couple we can’t stop drooling over. Their engagement was a close family affair, we only hope for their marriage to be extravagant and out of ordinary. Only a few days back Mukesh Ambani’s daughter Isha Ambani got engaged to Anand Parimal. Of course, we are all eyes to see India’s richest wedding. The only daughter of Isha Ambani’s wedding will surely be a sight to admire. 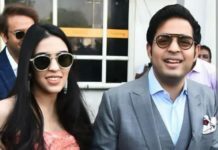 Mukesh Ambani’s elder son Akash Ambani got engaged to Shloka Mehta in a lavish ceremony held at the Ambani’s Mumbai residence. From dance performances to culinary delights everything was grand. We can’t wait to see how much more grand the wedding will be. Varun Dhawan’s has been in a long-term relationship with Natasha Dalal. Although the actor has been tight-lipped about his love life, the paparazzi have spotted them often indulging in romantic getaways. The couple has even attended various private parties and film screenings together. We would love to see the super hot couple tie the knot.